17 "Communism and social justice"
Rick Nagin, born circa 1941, is a prominent Ohio activist and member of the Communist Party USA. Nagin is Ohio correspondent for the Peoples World, has written for the paper and its predecessors since 1970. He has lived for 21 years in the Archwood-Denison Brooklyn Centre neighborhood. Nagin joined the Communist Party USA circa 1970, inspired by Gus Hall. Nagin is a member of the Newspaper Guild, Communications Workers of America, he is a delegate to the North Shore AFL-CIO and serves on its political coordinators committee. He also represents the Peoples World on the steering committee of Cleveland Jobs with Justice. He is the husband of Ann Pallotta and the father of Rachel Nagin and Molly Nagin. John F. Kennedy's presidency and the Vietnam War were defining moments of Nagin's years studying science at Harvard University and Rockefeller University in New York. Kennedy's assassination, he said, "really drove home to me the right-wing danger in this country." Nagin was obsessed with stopping the war and curious about socialism. The war, he thought, was "really to extend corporate capitalism to southeast Asia" and "a threat to democracy in the U.S." He began reading communist publications after receiving one at a peace rally. Leaving behind his biochemistry degree and doctorate in biology, Nagin joined the Communist Party USA in 1970 and began writing for its newspaper, known today as the People's Weekly World. Nagin's party involvement led him to Cleveland, where communists hoped to gain traction with steelworkers. It also led him to Gus Hall, the party's leader, who had become a perennial candidate for president. Nagin covered the campaigns. "I was just fascinated with how he was able to talk about these progressive programs -- things we talk about today -- national health care, public-works programs," Nagin said. In 1980, Hall recruited Nagin, who had become Ohio Communist Party chairman, for a national slate of communist candidates. Nagin made the U.S. Senate ballot as an independent and received more than 40,000 votes in his race against John Glenn, the incumbent Democrat. Nagin was encouraged. A year later, he challenged Cleveland Mayor George Voinovich, a Republican. His candidacy generated little interest, as did subsequent bids for the Ohio House. "To me, it was a way of breaking down a lot of Cold War prejudices," Nagin said of his early, long-shot political campaigns. "At some point, I figured, I was going to have to connect with the people. I finally realized that I needed to run from the grass roots." Noticing a large influx of Puerto Ricans in his West Side Cleveland neighborhood, Nagin organized a voter registration drive for Hispanics. In 1989, he launched the first of three failed bids for the Ward 14 council seat. Eight years later, Nelson Cintron became the city's first Hispanic councilman and chose Nagin, one of his opponents, to be his City Hall aide. Nagin resigned as head of the Ohio Communist Party to take the council job. He served as Cintron's go-to guy for seven years before being fired because he had begun to assemble a campaign to seek the Ward 15 council seat without the blessing of council leaders. As in previous council races, Nagin failed to finish first or second and emerge from the primary. He placed third behind incumbent Emily Lipovan and Brian Cummins, the eventual winner. Nagin's candidacy in 2009 for the Ward 14 seat surprised some. Cintron, his former boss and ally, had been ousted four years earlier by Joe Santiago and was seeking a comeback. But Nagin said redrawn ward boundaries convinced him that this might be his year. His Brooklyn Centre neighborhood, part of the old Ward 15, is being tucked into a new Ward 14. He beat Cummins in those precincts in the 2005 primary. And he believes that Hispanic voters familiar with him from his role as Cintron's aide have tired of Cintron and Santiago. Soon, opponents realized that Nagin no longer was an also-ran. He was a heavyweight. His years of work on behalf of organized labor scored him a second straight endorsement from the North Shore Federation of Labor. He picked up support from other organized-labor interests as well as several key Hispanic activists. Nagin yard signs appeared overnight in large numbers. Harriet Applegate, executive secretary of the local AFL-CIO chapter, said Nagin was a paid political coordinator for the group during the 2006 elections and volunteered in 2008. "As far as I'm concerned, it's loyalty to someone who has paid his dues," Applegate said of the Nagin endorsement. "It appears to me that he has a better chance this time than last time." Nagin also trumpets an endorsement he said he received last month from Dennis Kucinich, the influential West Side congressman. But Kucinich has not responded to requests to discuss or even confirm his support. He caught flak in the 1990s for allowing Nagin to be a volunteer. Perhaps Nagin has stuck around long enough that voters uneasy with the thought of a communist representative have warmed to the idea. Maybe, as he likes to believe, the country's political mood is shifting to the left with the election last fall of Barack Obama as president. "I think it's significant," Nagin said of a communist being a viable council candidate in a large city. But, he says: "This is not a party campaign. I am a coalition candidate." Even so, his candidacy has excited other communists. Part of the $6,650 in campaign contributions that Nagin disclosed before the primary came from people whose names appear as writers or subjects in the People's Weekly World. Wally Kaufman, who replaced Nagin as chairman of the Ohio Communist Party, gave Nagin $1,000. Another $700 came from Bill Mackovich, a retired steelworker from Chicago who this year pledged his $250 federal stimulus check to the communist newspaper. "He's always been fighting for working people," Mackovich said in a phone interview. "It's a different ballgame today. You tell people that you're a communist, they say, 'So what?' "
Nagin also received $100 from someone whose family name is synonymous with capitalism: David Rockefeller, Jr. Nagin attended prep school with the great-grandson of the oil baron. Cummins believes Nagin's success is largely attributable to name recognition attained after years of appearing on ballots in West Side precincts. Voters may be past the communist issue, but Cummins said that will not stop him from comparing his record with Nagin's. As both a Democrat and member of the Green Party, Cummins acknowledges sharing common ground with Nagin in that both have "not been satisfied with the two-party system." But that is where the similarities end. 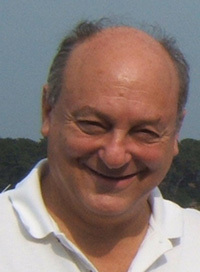 Cummins is researching old news articles that Nagin has been quoted in, as well as pieces he has written for the People's Weekly World. To draw a contrast, Cummins cited a 1990 interview in which Nagin discussed his communist views. "In 1990," Cummins said, "I was going overseas for the Peace Corps." Others are unsure how Nagin's politics will play. "That's up to the voters to decide," Applegate said. Nagin worked in the campaign of Ed Davila, the first Hispanic to run for Ohio State Representative. Ward 14 Councilmanic Assistant for over seven years. Nagin helped elect Cleveland's first Hispanic city councilman, Nelson Citron and served as his executive assistant for over seven years. Rick Nagin is a Labor and Politics Reporter for the People's World. Rick Nagin speaks Spanish and has traveled in Puerto Rico and Latin America. He as worked closely with Hispanic social clubs and agencies and NAACP Voter Fund. Nagin was a member of the San Lorenzo Club and helped found the Cleveland chapter of the Labor Council for Latin American Advancement (LCLAA) affiliated with the AFL-CIO. Rick Nagin is a delegate to Cleveland AFL-CIO from Communications Workers of America, he is active in efforts for health care, living wages, and union rights. He serves on the Cleveland Jobs with Justice Steering Committee. Endorsers of the call included Rick Nagin, Cleveland, Ohio. 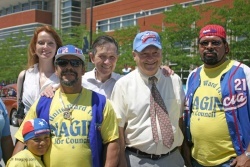 Nagin helped Congressman Kucinich set up a Steel Summit that "succeeded in saving the Cleveland steel mill, preserving the union contract and saving the jobs of thousands of area workers". Nagin had been a key organizer for Dennis Kucinich’s campaigns for Congress and president and for the 2004 John Kerry presidential campaign. Rick Nagin was Labor Coordinator for Dennis Kucinich's 2008 primary campaign. During Nagin's 2009 run for a seat on the Cleveland City Council, his Communist Party USA membership again became an issue. A former chairman of the state Communist Party has come closer than ever to taking a city council seat after years of trying for public office. Registered Democrat Rick Nagin finished a strong second in this month’s primary race in Council Ward 14. He faces a Nov. 3 nonpartisan general election runoff against the top vote-getter, Brian Cummins. Nagin, 68, failed in three previous bids for a council seat. He resists being labeled a communist, saying Monday the word was demonized by 60 years of Cold War propaganda designed to prepare people for war and intimidate those with liberal ideas. Nagin, who joined the Communist Party in 1970, has written for the People’s Weekly World newspaper, which describes itself as having a “special relationship with the Communist Party USA,” as recently as May. He said the Communist Party USA has an honorable and distinguished history of working for economic, civil and democratic rights. But he suggested the party needs a new name, perhaps the New Socialist Party. In the city council campaign, he said the issues are much more local — safety, vacant houses, jobs, programs for young people, block clubs. In 2012 Rick Nagin was the Democratic Leader in Cleveland Ward 14 and serves on the County Democratic Party Executive Committee. In 2014, he still served as the Democratic Leader in Cleveland Ward 14 and serves on the Cuyahoga County Democratic Party Executive Committee. In 2017 Cleveland City Councilman Brian Cummins faced a spirited challenge from Jasmin Santana, a longtime ward resident who has been endorsed by the ward's Democratic club and its influential leader, Rick Nagin, who finished second to Cummins in the 2009 election. We will hear from Cleveland, Ohio about a big victory electing the first Latina to city council and how the West Side Club has been at the center of that campaign and successfully took on red baiting in that key election.